Blue! 42! Hut, Hut! This is no tailgate, this is a Super Bowl Party! One of the biggest games in all of sports, so your party should match! Break out your finest beer mugs, your good crock pot and dust off your coffee table! 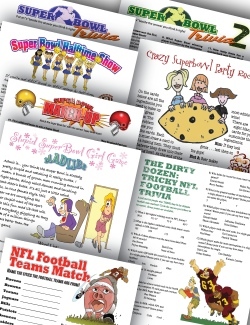 Our Superbowl Party ideas, mixed with your love of the game will sure to win the crowd. What makes a Super Bowl Party great? Food, drinks and some good old friendly betting! In a medium-large sauce pan evenly spread the cream cheese on the bottom. This works best with the back of a spoon, and if the cream cheese is soft from sitting out for a few minutes. Next, pour and even layer of salsa on top to just cover the cream cheese. Last, cover the salsa with the shredded cheese and Ta Da your done! Prepare ahead of time and cover with plastic wrap and stick in the fridge until game time. Why go to all the work yourself preparing the food. Ask your friends and family to help with a Potluck. Share Your Super Bowl Recipes! For a large group of beer drinkers, consider getting a keg. Make your own by attaching two golf balls to a piece of string about a foot long. Drill a small hole and feed the string through. You can also make the stand by using ¾ to 1” PVC pipe creating three levels at different heights. Throw the golf ball string contraption and try to get it on the rungs. Each rung is worth a different point. Play with bean bags and a piece of plywood with holes cut into it. Try and get the bean bags in the hole! Fan dress up contest: Wigs, face or body paint, Jerseys, Mascot outfits etc. Each guest will pick a phrase out of a hat and whenever that phrase is used they take a drink. If they miss it and someone notices, they take two sips. Whenever the camera shows a celebrity in the stands everyone takes a sip. Place 6 glasses or big plastic cups of beer on either end of a table in the shape of a pyramid. Players on each team take turns standing at one end of the table and trying to bounce a ping-pong ball into the glasses at the far end of the table. The team whose balls bounce and land in a glass the most wins. You can decide on drinking rules. Write NFC on the top and AFC on the Left, Or Team names if you know. Once all boxes are full, randomly draw and write the numbers 0-9 across the top and 0-9 down the left hand side. The person who has NFC 4 and AFC 6 wins the 1st quarter prize. Repeat for 2nd, 3rd and end of game. Prize amounts will be depend on square value. The more money the square cost, the bigger the prize. Divide the first three quarters evenly and the final quarter will win more. 1. Coin Toss. Before the game begins take a pole on who will win the coin toss. Make a chart with both teams and have your guests write down their guess and pay the determined amount. After the toss divide the money by the winners. Q: When and Where was the first Super Bowl? A: The first Super Bowl was held on January 15, 1967 at the Memorial Coliseum in Los Angeles, California. It was known as "The NFL-AFL World Championship Game". Q: Who was the MVP of the first-ever Super Bowl? Q: Who was the first ever 3-time Super Bowl MVP? Q: Which quarterback has the record for most consecutive completions in a Super Bowl? How many? Q: Which player holds the record for most rushing yards in a single Super Bowl? 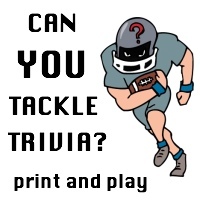 Q: Which player has the most career fumbles in the Super Bowl? Q: Who was the first wide receiver to win Super Bowl MVP? Q: Which was the first Super Bowl in which the winning points came on the final play of the game? Which team scored? Disclaimer: We here at Perfect Party Ideas only promote fun, and safe party practices and don’t indorse excessive consumption of alcohol or illegal gambling. However, we do believe strongly in having fun. So go on and Party Super Bowl Style!